Got some cool travel mug designs? Start showing them off with Placeit! Our print mockups will have your design front and center, there's a ton you can choose from and you can customize them to your style. Cool, right? The best part of all, no additional software is necessary. Get your tumbler designs out for everyone to see. 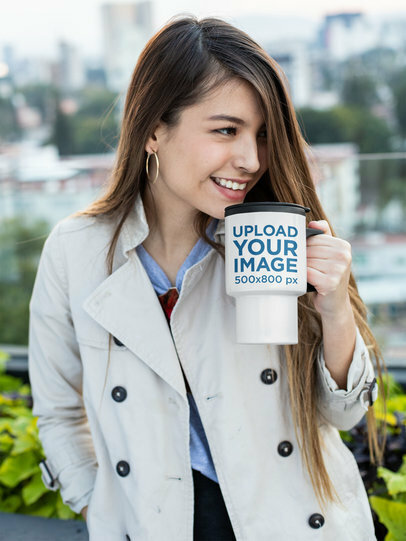 Create a cool visual featuring a travel mug standing on a solid background with Placeit's mockups and show your audience a clean and professional version of your latest design. Awesome, right? 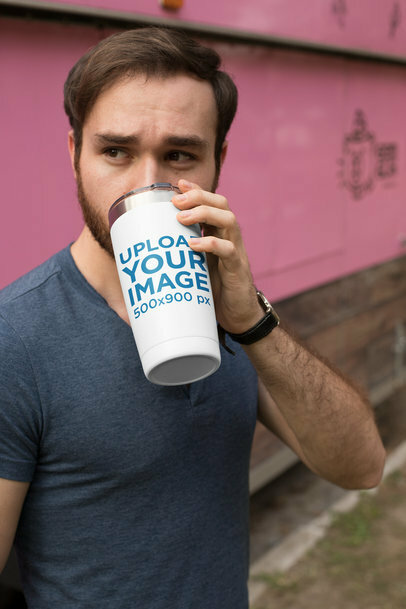 Start now, create a cool visual to promote your latest travel mug design using a mockup from Placeit and watch your sales grow after that! Create a fantastic promo campaign with Placeit's print mockups. Just edit the settings to your liking and you'll be ready in no time. You can even make your Travel Mug's background transparent! Cool right? What are you waiting for? 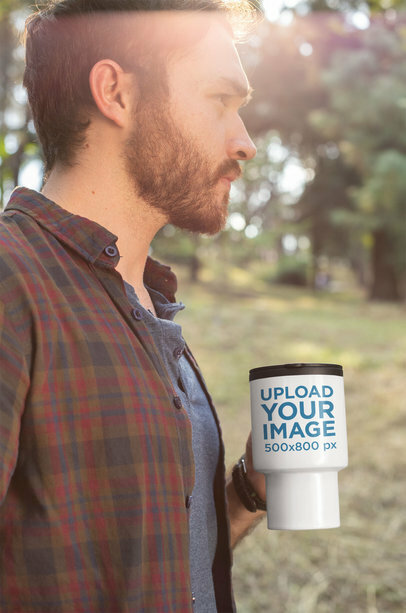 Edit your Travel Mug mockup now! 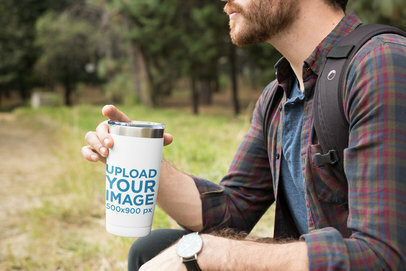 Get everyone to see your travel mug designs with Placeit's cool print mockups. We have a ton of different models, locations, and settings for you to choose from. You can even change the mug's color. Amazing, right? What are you waiting for? Edit your travel mug mockup now. Looking for a more creative way to promote your Travel Mug designs? Placeit's super easy to use print mockups are the way to go! Our mockups are customizable and will always showcase your design front and center. This one shows off your travel mug in a super trendy way. Try it out now. 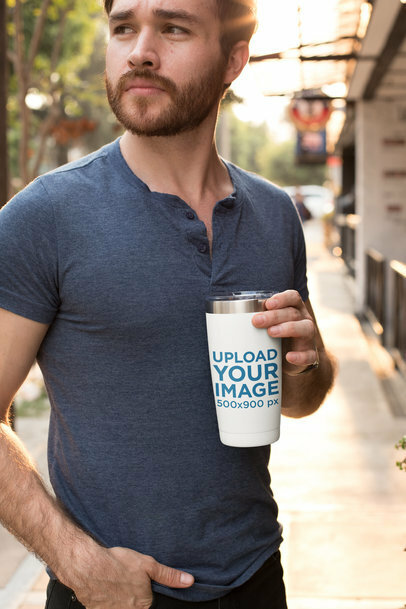 Get ready for an awesome mockup to promote your travel mugs! Placeit's print mockups are super easy to use. All you have to do is edit the settings to your style and you'll be ready in no time. Just try it out, it's super fast! Edit your travel mug mockup now. 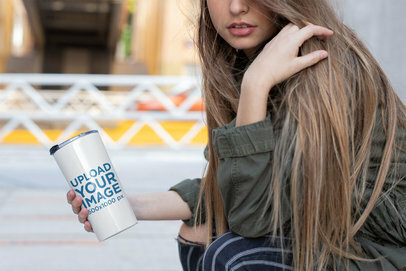 Use Placeit's mockups to promote your latest designs for travel mugs using images that will leave your customers amazed! 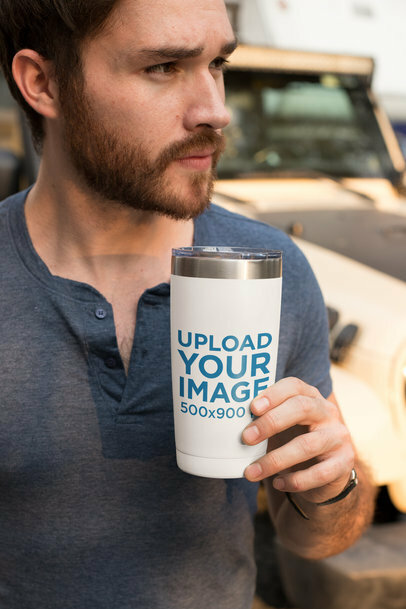 Showing a photorealistic version of your designs is an excellent choice if you want to make your audience see a real-life version of your travel mug in a realistic environment. Use Placeit now and make your sales grow with cool visuals! 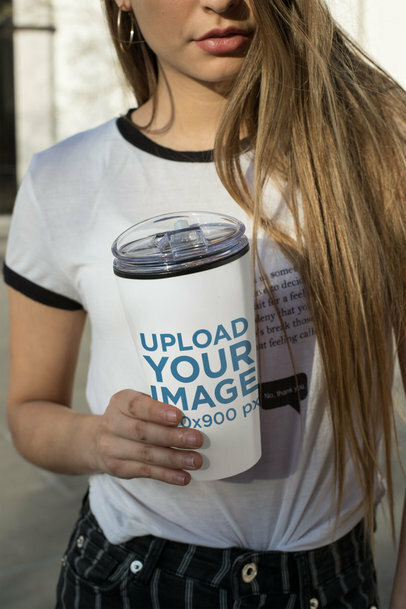 Create a lovely visual of a girl holding a tumbler with Placeit's visuals! Start now, Placeit has tons of mockups you should use to promote your designs in a way that your audience will definitely love. Photorealistic images are the best way to help your customers connect better with your brand's personality. 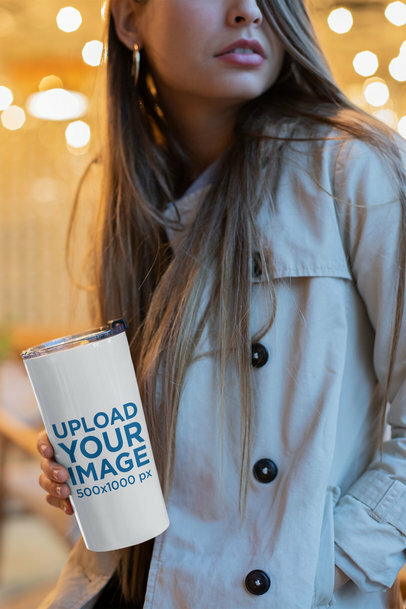 Use a phenomenal visual of a woman holding a travel mug and promote your latest designs with an image that will leave your customers astonished! Start now, beautiful images that will complement your already cool designs are a must in your marketing campaign if you want to start getting more sales. Use Placeit's mockups and watch your revenue grow after showing your designs with gorgeous images! 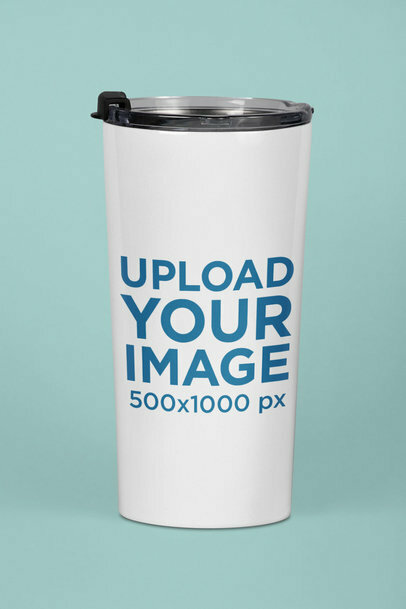 Promote your travel mug designs in a super eye-catching way with Placeit's print mockups. They're super easy to use and don't require any additional software. You can even change the mug's color and really make the image your own. Cool, right? Try it out, edit your Travel Mug mockup now. 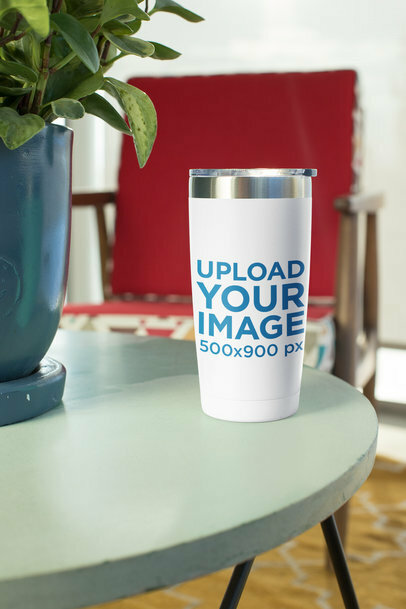 Get even more creative with your Travel Mugs and promote with Placeit's print mockups. Our mockups are super easy to use and don't require any additional software. You can even change the mug's color. Cool, right? Try it out, you'll be done in no time. Looking for a better way to promote your already amazing travel mug designs? Use Placeit! 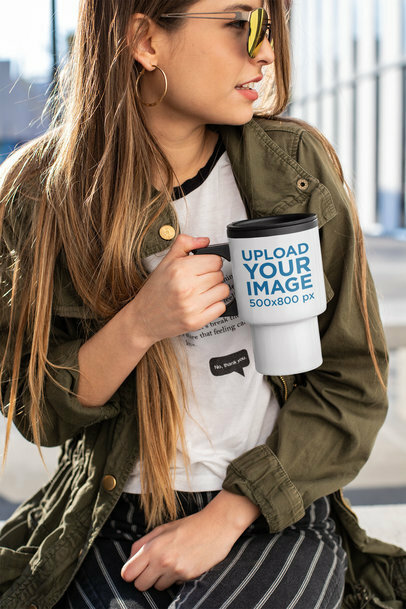 This amazing image is a great choice if you want to showcase your design using an image that will make the colors and design of your latest travel mug stand out. Use now Placeit's mockups and make your sales grow by showing your designs on high-quality images! 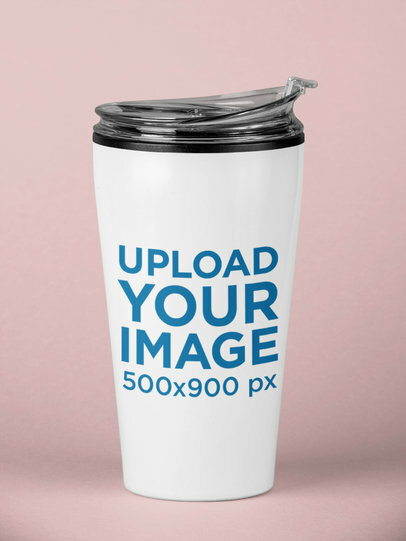 Create a gorgeous visual to promote your latest travel mug design using Placeit's mockups! 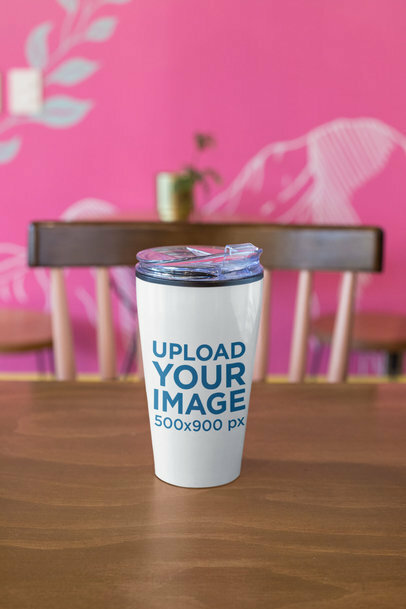 This cool image is an excellent choice if you are looking to get your image marketing to the next level, start now using mockups from Placeit and watch your revenue grow after showing photorealistic visuals of your travel mug designs. 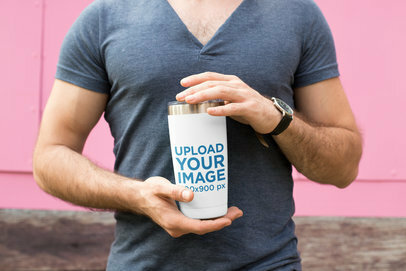 Create a gorgeous image featuring a 20 oz personalized travel mug with this amazing mockup from Placeit! You don't have to worry about understanding how to use complicated software or even searching for a graphic designer, use Placeit and make your own mockups with a simple and powerful interface that will give you the best results. 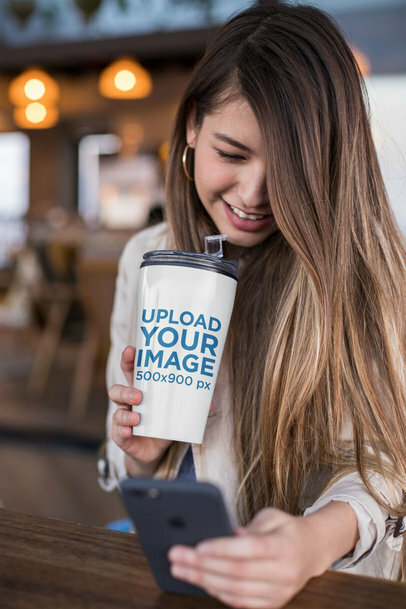 Create an amazing image of a travel mug using this mockup from Placeit and make your revenue grow by showing your designs in a photorealistic visual that your customers will definitely love. Showing a more realistic version of your already awesome design is a great way to give your audience a dimension of what your products look like! 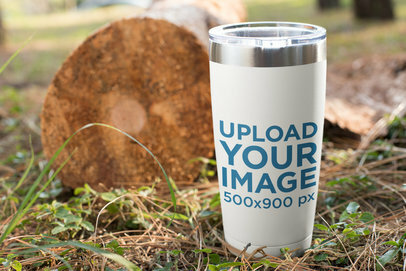 Promote your tumbler and travel mug designs with Placeit's easy to use print mockups. Just edit the settings to your liking, you can change the background and tumbler's color. You can even make the background transparent. Edit your travel mug mockup now. It's super easy to use! 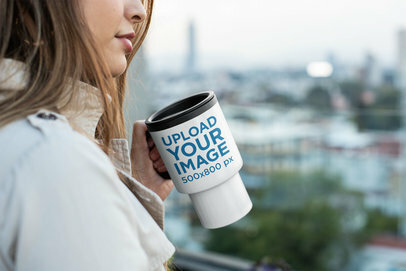 Create a beautiful visual to promote your latest designs for travel mugs using Placeit's mockups! 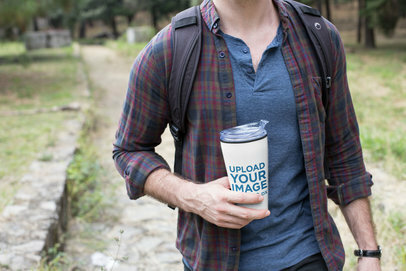 Start now, this gorgeous image is an excellent choice if you want to make your customers get a glimpse of what your travel mug design really looks like in an outdoors situation. Using photorealistic visuals from Placeit is a great choice if you want to get more of your audience to buy your products! 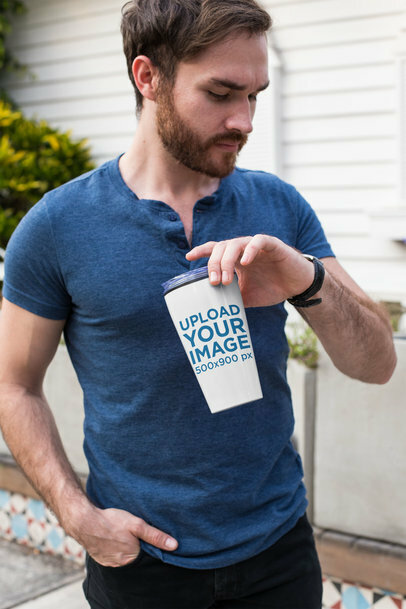 Create an amazing visual featuring a man holding a travel mug outdoors with this mockup from Placeit! It's an excellent choice if what you're looking for is a gorgeous image that will help you make your design stand out visually and catch your potential customers' attention. Start now using Placeit's visuals to sell more travel mugs! 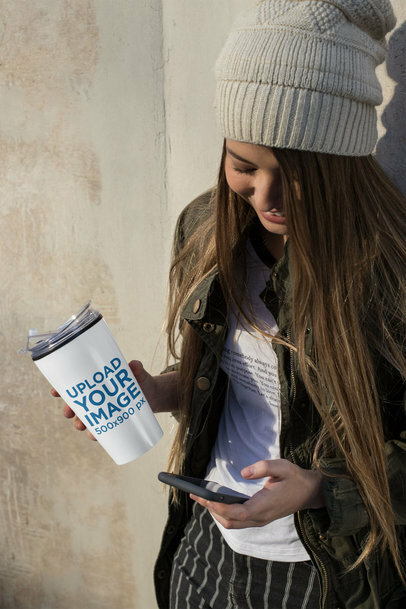 Use this amazing image of a girl watching her phone while holding a travel mug and promote your latest travel mug design using a gorgeous visual with a photorealistic set that will leave your customers amazed. 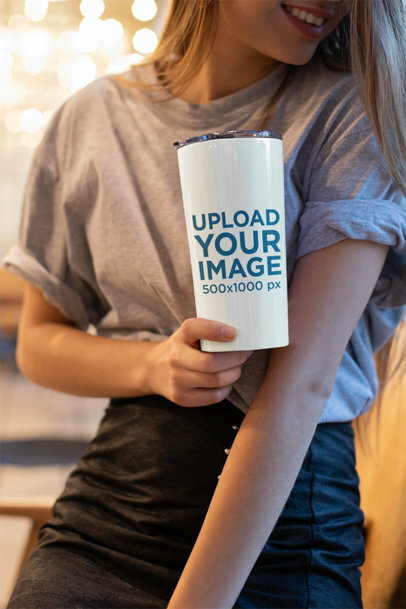 Start now, use Placeit's travel mug mockups and watch your revenue grow after using beautiful pictures to portray your designs! 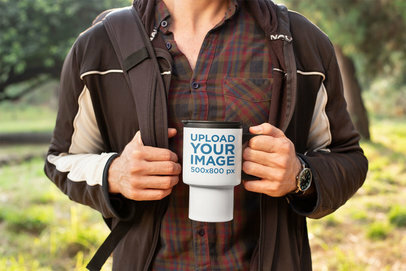 Create a gorgeous visual of a man holding a travel mug with Placeit's travel mug mockups! 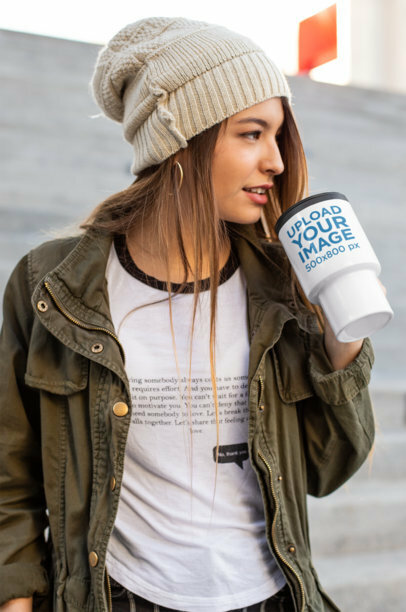 This cool image is a great choice if you want to promote your travel mug designs using photorealistic images that will make your customers understand what your products actually look like in real life. 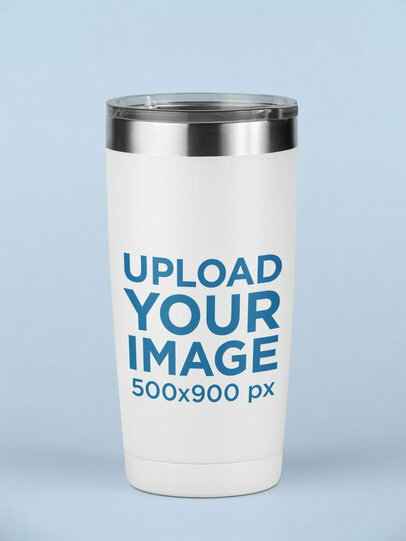 Start now and make your travel mug sales grow with Placeit's mockups! 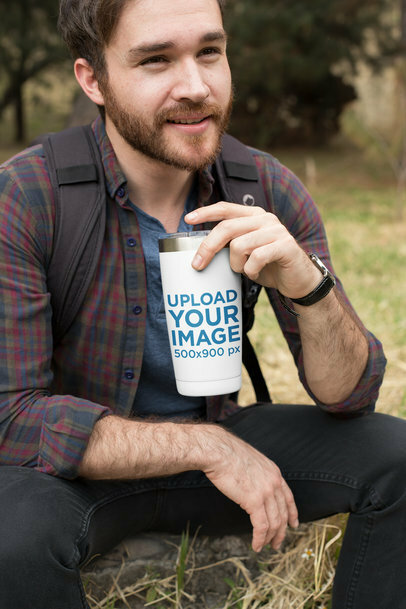 Create an amazing image to promote your latest travel mug design using a mockup from Placeit that will definitely help you make sell more travel mugs! This image features a beautiful girl holding a tumbler and her cellphone while against a concrete wall, it's a perfect urban setting for a gorgeous urban design like yours. 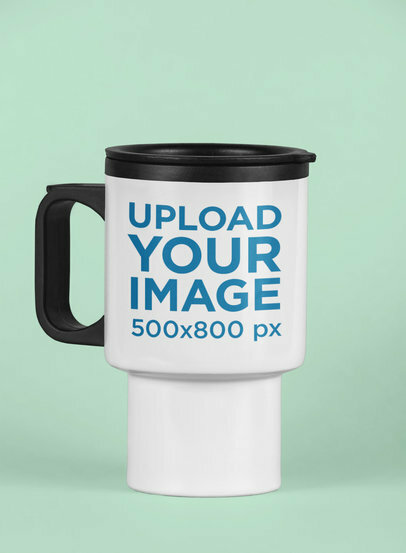 Create a phenomenal image to promote your latest travel mug designs with Placeit's mockups! This cool mockup is an excellent choice if you want to display an urban design for a travel mug in a city environment, where it can shine the most. Start now and make your customers want even more your products! 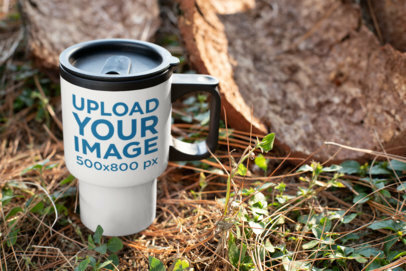 Create a cool visual featuring a travel mug standing on the grass against a trunk, it's an amazing image that you should use if you are looking to show your design for travel mugs with a gorgeous visual. 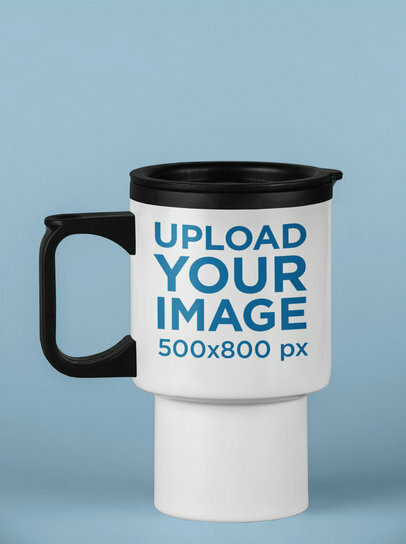 Start now using mockups from Placeit and make your revenue grow by showing your travel mugs designs in amazing images! 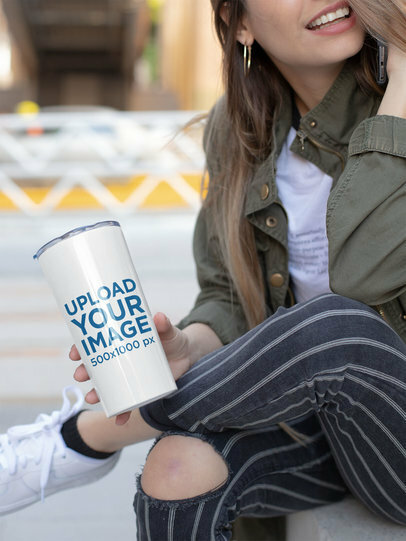 Looking for a way to create a cool visual that will help you display your latest tumbler design in a better way? Use Placeit's mockups! This outstanding tumbler mockup is a great choice if you are looking to create an image that will definitely amaze your audience. 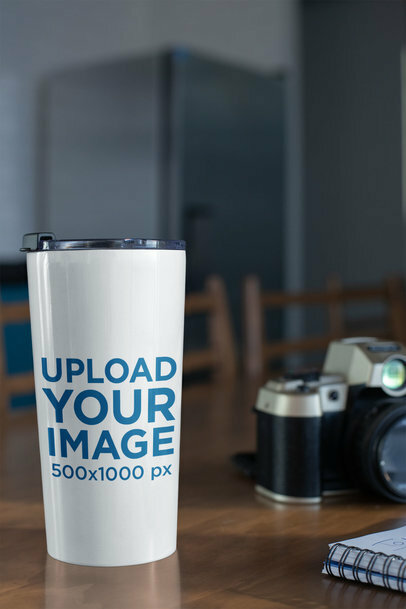 Show a more realistic version of your latest travel mug with Placeit's tumbler mockups! Promote your travel mug designs on an actual travel mug or tumbler! Placeit's print mockups are incredibly easy to use and don't require any additional software. You can even change the travel mug's color! Try it out, edit your travel mug mockup now. 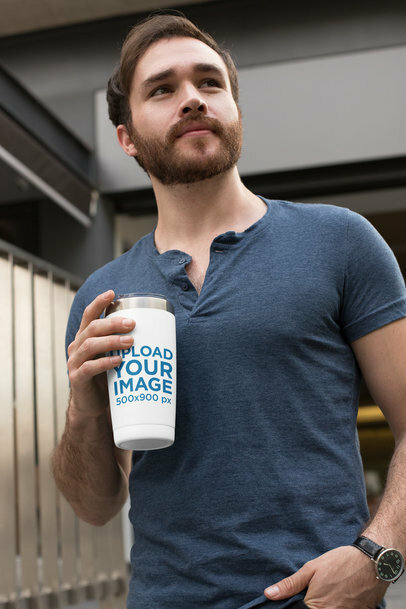 Use a gorgeous visual from Placeit to promote your travel mug design and leave your customers stunned with a picture that they can really relate to! 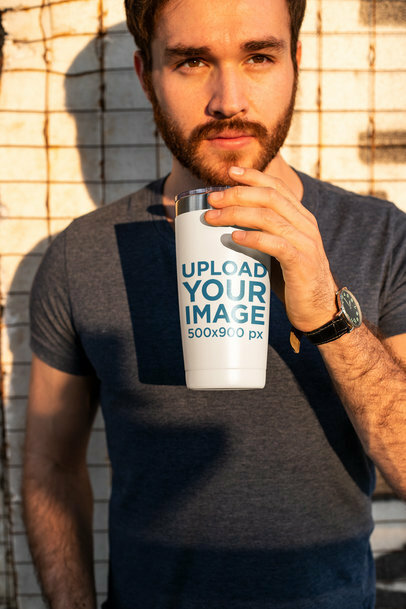 This amazing mockup is a marvelous choice, it will help you portray a photorealistic environment around an also realistic image of your travel mug design. 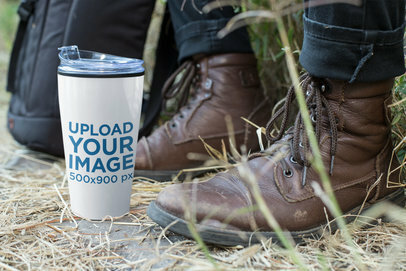 Create a gorgeous visual to promote a design for a tumbler using Placeit's visuals! This cool mockup of a tumbler standing on a wooden desk at an office is a great choice if you are looking to display a design using a photorealistic visual that will definitely astound your audience. 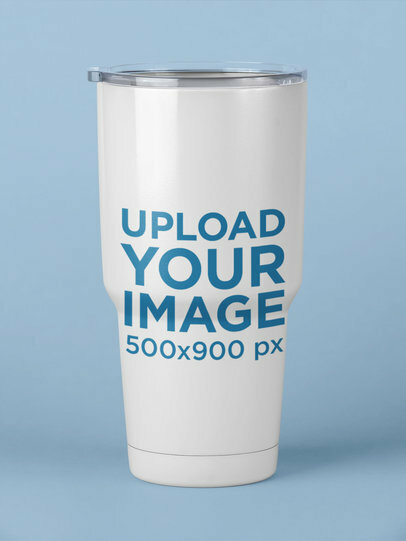 Start now and sell more tumblers using Placeit's mockups! Create a cool visual to feature your travel mug design using Placeit's mockups! 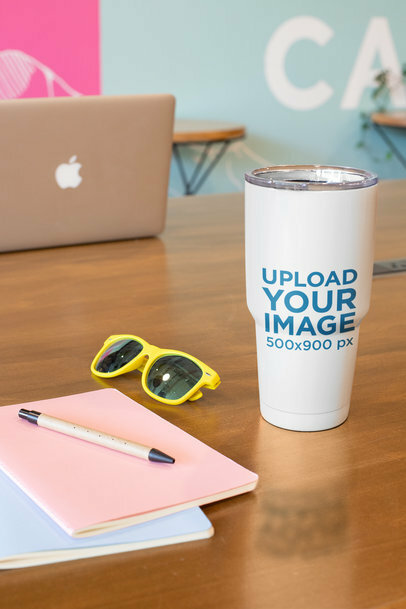 This cool image is an excellent choice if you want to display your latest travel mug design in a photorealistic environment. 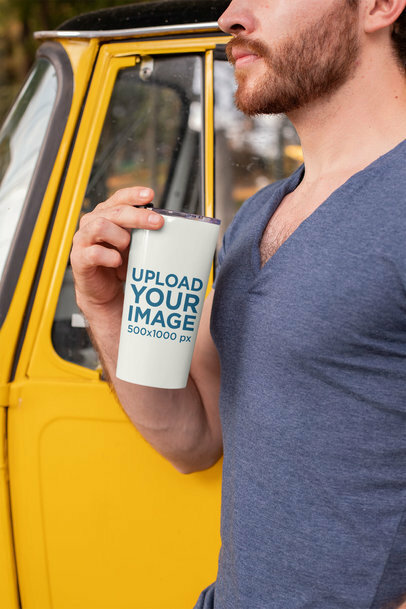 Start now using Placeit's travel mug mockups and see how your revenue grows after showing a better image of your designs! Looking to promote your travel mug designs using images that will make them stand out even more? Use Placeit's mockups! 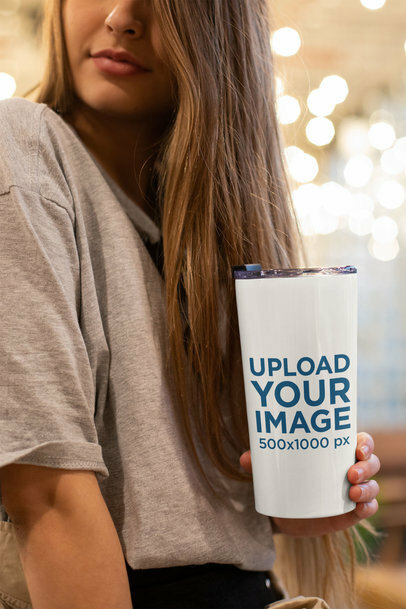 A travel mug mockup by Placeit is the perfect choice if you are looking to display your designs in an image that will complement its colors and add a high-quality component to your beautiful design.